Our 22nd year in business was a good one for both us and our clients, and included some important anniversaries of key events in the factory’s growth. First, we paid tribute to the ten year anniversary of the iPhone SDK in March, and then the App Store a few months later. Twitterrific has been there since the very beginning of this revolutionary new kind of software! We started off the year celebrating the first anniversary of Project Phoenix which brought Twitterrific back to the Mac in style. It wasn’t long however until our beloved Ollie ran afoul of some major changes at Twitter. Back in April we saw looming problems that would affect all third-party Twitter apps and in July we were forced to start removing features from both the iOS and macOS apps. In August, Twitter removed streaming and our ability to send push notifications. When Halloween rolled around it seemed fitting to cut the poor bird in half to help celebrate the spooky season. Despite all of these setbacks, we’re still adding new features and fixing bugs. In November we introduced you to Ollie’s extended family, a fun set of custom app icons you can use to give your desktop or home screen a makeover! Another one of our favorite products had an amazing year. It all started in March when we released the second major version of Linea Sketch. This update introduced moving and transforming parts of your sketch, image import, and added an innovative feature called ZipLine. We also integrated with all the latest iOS features to support portrait orientation, split screen mode, and drag & drop. Then in May we added ways to manage the colors in your sketches and projects while retaining Linea’s famous simplicity. We didn’t stop there, though. Oh no. In September we were excited to launch Linea Go for the iPhone with all the power and ease of use of Linea Sketch in a fun-sized app that fits in your pocket. To finish up the year, we updated the whole Linea product line with powerful new fill and blend tools. We also expanded our wildly popular ZipLine feature so it can recognize geometric shapes. iCloud version history and support for the latest iPads and Pencils were also included in these comprehensive releases. If you love what we’re doing with Linea, please take a moment and leave us a tip. This kind of rapid development comes at a cost, and the only other alternative we have to pay for this work are app subscriptions. Of course there’s more to our digital lives than just making wonderful apps. Our client work challenges our design chops and keeps the conveyor belts humming right along. Projects for the Dark Sky weather app and a fun, custom version of Apollo for iOS were two of this year’s standout clients. We also like to keep abreast of the latest developments for macOS and iOS including Safari so we were thrilled when a new kind of “favicon” was introduced a few years ago. And even more thrilled when those same icons came to all our tabs in 2018! In October, Craig took a deep-dive on how Safari is changing to support “dark mode”. Currently, this is limited to macOS, but we wouldn’t be surprised if this change makes its way to iOS in the coming year. Accessibility is another topic that’s near and dear to our hearts. Making products that anyone can use is something we strive for. Back in July we posted about the importance of making your tweets more accessible by explaining how VoiceOver works with emoji and Unicode. The article is a big help for people with visual disabilities and has been shared thousands of times. When we started this business back in 1996 we would never have guessed we’d still be here twenty-two years later, doing all the things we love. It’s only possible thanks to the generous support of our loyal fans, our clients both big and small and all the users around the world who purchase and love our apps. All of us here at the factory send our thanks and wish you and yours a wonderful holiday season, a Merry Christmas and a Happy New Year! Today’s update for Linea on both iPad and iPhone brings an array of features that make sketching out ideas easier than ever. We’ve extended the amazing capabilities of ZipLine to draw perfect geometric shapes, added two brand new tools, included iCloud-based version histories for your documents, and a host of other refinements. This is an amazing release: you’ll wonder how you lived without it! 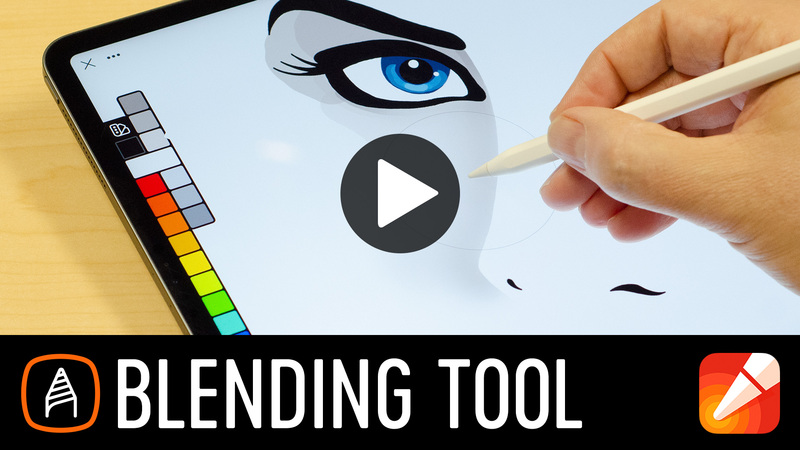 With just a tap, Linea’s new paint roller tool lets you quickly flood areas of a sketch with color. The tool takes all the currently visible layers, including templates and grids, and uses them as the fill boundary. 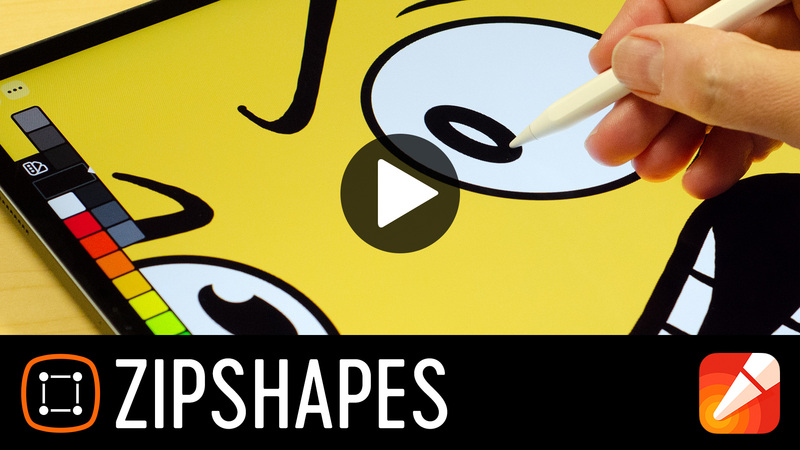 You can also draw shapes by hand to quickly color a free-form area. We’ve had a blast using it with Linea’s vast collection of guides to create some familiar and cool retro art – your creativity knows no bounds! Your browser doesn’t support video. Download to watch it in another app. Linea’s other new tool lets you soften or smudge areas of your sketch. In the first mode, you can smooth hard edges to create gradients. The other mode lets you push color around to make fluid shapes. Combined with pressure from the Apple Pencil and varying brush sizes, this tool can be used for a huge variety of effects. One thing we love to do is change the finger action in Settings from erase to smudge. When combined with the pencil tool, it feels a lot like working with oil pastels! ZipLine was a revelation: a simple and effective way to draw straight lines. We loved it so much, we extended it to any shape you can imagine! Simply draw a rough circle, square, rectangle, oval, or polygon and hold at the end. After a configurable delay, ZipShape will activate and transform your rough version into a clean, precise shape. 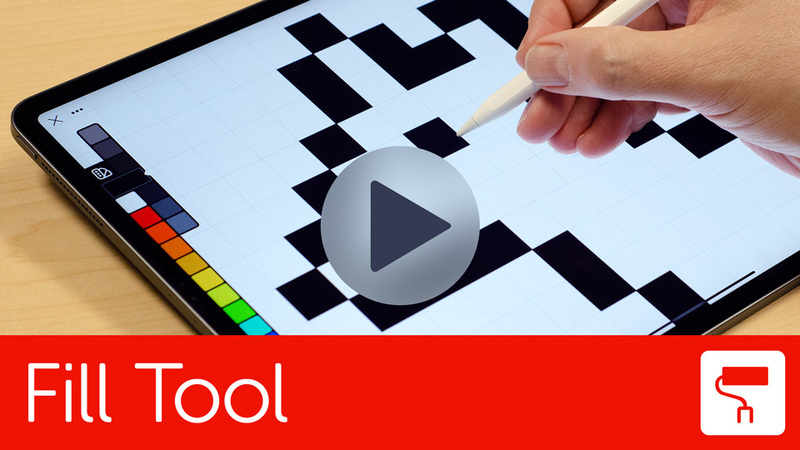 It works with all of Linea’s drawing tools – including the new fill tool. You don’t have to be perfect – after the shape is generated, there are transform handles you can use to tweak its final position and appearance. No rulers or stencils required! Want to go back in time and fix a mistake or take a different creative direction? Tap Select in the Project view, choose a sketch, then tap Versions in the Actions (⋯) menu. Linea presents you with a list of edits and allows you to revert or create a copy. Double-tap on the new Apple Pencil can be configured to switch tools, change interface state, enter selection mode, or modify tool sizes. There are new settings for what your finger does while an Apple Pencil is in use: erase, blend, draw, move the canvas, or ignore. We added a fun new mid-tone paper background called Mulberry. New template for full-screen tablet with a minimal bezel which matches the 11″ iPad Pro aspect ratio. Don’t forget to check out our Tips & Tricks page for some great ways to improve your workflow as well as Sketch’s and Go’s version history pages for the complete list of what’s new. If you aren’t using Linea yet, today’s major update is a great reason to try it out! Head on over to the App Store to download Linea Sketch for iPad or Linea Go for iPhone and you’ll be creating in no time! Today we’re pleased to offer Twitterrific updates for both macOS and iOS with several new custom application icons to change how Twitterrific appears on your macOS Dock or your iOS home screen. There are three new Ollie variants including Raven, Cardinal and Goldfinch which bring a new splash of color and make Twitterrific really stand out in a sea of boring, flat pixels. On the iOS side we’ve also added two additional variants that include a pure black background for all of you iPhone X and XS users out there that want to show off that gorgeous OLED screen. These new black-background icons blend right into the home screen and help make your favorite Twitter client feel brand new. That’s not all! Twitterrific has always color-coded mentions, replies and your own tweets so they are quick to spot when scrolling through your timeline. We personally enjoy the clarity of color-coded tweets, but we also realize that not everyone does. If you’d rather they all looked the same, we now have a new presentation option for you. Today’s cross-platform update includes other improvements like visual tweaks for Apple’s awesome new iPads, profiles that show the date the user first joined Twitter, and several important bug fixes. Be sure to check the macOS and iOS App Stores for the latest and update your copy today. Enjoy! While these changes are currently limited to native macOS apps, the arrival of Marzipan next year makes it likely that iOS developers will be confronted with similar changes in UIKit. A dark user interface would be a reality on all of Apple’s platforms, including tvOS and watchOS. So let’s take a moment to see where things are now, where they’re headed in the near future, and look at strategies for adapting content presentation. Dark Mode has been on developers’ minds since its introduction at WWDC 2018. And since it’s an extension of the dark and light AppKit appearances that debuted in Yosemite, the consequences of this new user interface are already well understood. For more information on what these changes mean from a Mac developer’s point of view, I recommend Dark Side of the Mac by Kuba Suder and Supporting Dark Mode by Daniel Jalkut. Apps on macOS have been able to embed WebKit since its introduction. Adding web content to native apps was one of its major design goals: an app called Safari was the the first one to use the new framework. Over the years many developers, both on macOS and iOS, have taken advantage of this framework for one simple reason: HTML and CSS are a great combination for presenting content. So it would make sense that all this cool new Dark Mode stuff would be available in WebKit, right? Nope, and making it happen is more difficult than you’d initially suspect. Web content has to exist in many different contexts. In applications you want content that matches the surrounding native frame. With apps like the App Store, it’s hard to tell where the native code ends and the web code starts. In this situation, you want web content to respect the user’s theme choice in System Preferences. The last post in Daniel’s series addresses the issue of adapting WebKit to an app’s needs. You’ll see how he’s watching for system changes and adapting the markup for an about box. While this proposed solution works great for a small amount of markup, injecting code into HTML won’t scale well for richly styled content. His approach also makes it difficult for a designer: they can’t work directly with HTML and CSS files. This adaptability has a downside for the majority of web content: the environment created inside the main browser frame usually exists on its own and wants to ignore Dark Mode. For example, you wouldn’t want a dark form control to suddenly appear on Wikipedia because of a system preference change. And where is the boundary between content and chrome: should a scrollbar color match the markup or the browser where it’s presented? Before you answer, consider these diverse viewpoints. The question is simple, the answer is not. Luckily the standards groups have been debating this issue for the past several months and have settled on a new media query called prefers-color-scheme. It’s not available in any shipping browser yet, but thanks to the WebKit team, it just landed in the new Safari Technology Preview. Whether this stays as a meta tag or becomes a CSS property is still being debated. It’s definitely something you want to keep an eye on if you use native controls on your site. With these changes, Dark Mode now becomes another aspect of responsive web design. As with device dimensions or color, the user’s environmental choices must be taken into account. Instead of adapting elements to viewport changes, you’ll be changing designs to match the user interface chrome outside that viewport. The problem now becomes logistical: there are a lot of color and image properties in our CSS. Do you really want to duplicate all those definitions for a dark theme? Or make changes in two places? Hell no. The solution is to start thinking about color differently. One of the things that made the switch to Dark Mode easier in macOS was its semantic treatment of color. There are variables like labelColor, windowBackgroundColor, and controlTextColor used to represent color values. Without knowing anything about macOS development, you can probably guess what these definitions look like. You’ve just started thinking semantically. When you’re dealing with light and dark variations of a color, it’s a lot easier to think of “text color” and not worry about whether it’s currently rgb(0,0,0) or rgb(255,255,255). It also helps when you’re dealing with a site’s branding: I can remember “Iconfactory branding color” but never rgb(229,36,30). This, of course, can be extended to images. If you’ve got a button image that changes depending on context, just call it “refresh icon” and forget about the url(). Luckily, a new CSS feature that’s starting to see wide browser adoption is available to make this dream a reality. Hello CSS variables. You’re not limited to using just colors, either. These variables can be used for font lists, URLs, and any other property type. Pretty awesome, especially when marketing decides they want to change your branding color, logo, and font face! Note that if you need to support themes on older browsers, you can use tools like Sass or Less to accomplish something similar. Variables are used to generate multiple CSS files which can then be switched using the <link> URL. In our experience, the two hardest parts of all this are coming up with semantic names and colors that work well in both dark and light settings. It’s more of a design problem than a technology issue. If you need help, we’re here to help. We’ve been dealing with these issues for years, both in apps and on the web, and want to share our experience making award-winning products. This is already pretty great, but we can make it even sexier with CSS animation. In the browser it adds a level of finish; in an app it lets you match the animation in AppKit layers. Note that transitions only apply to the element where they’re defined or inherited. If you set colors on another element, like a <button>, you’ll need to create a transition on that element, too. Thanks to color variables that start with two dashes, it’s easy to search for them in your markup. This whole treatise got its start with some Halloween decorations. Every year we do something fun at the Iconfactory and this year I noticed a problem. The scrollbars looked bad in the new macOS Dark Mode, so I worked around it with CSS to make them scary. Scrollbars have been customizable in WebKit for almost 10 years. Unfortunately, this mechanism never saw standards acceptance and has retained the “-webkit-” vendor prefix. The WebKit implementation of pseudo-elements for scrollbar is considered to be a feature mistakenly exposed to the web. After deploying our decorations, I showed one of the members of the WebKit team the screenshot below and asked what was going on. The white-belt-with-dark-pants look at Daring Fireball is something being worked on – some of the changes in WebKit require an update to the scrollbars that AppKit provides. This problem can only be addressed by a macOS update. My earlier question about who owns the scrollbars at the boundary between web content and a native app is indeed a difficult one. The good news is another new standard called scrollbar-color has been proposed. It includes four choices: auto, dark, light, and custom. The choice of auto lets the browser decide what’s best, or you can use light and dark to adapt them to the content you’re presenting. These features are still in flux, but it’s clear to me that the standards bodies are aware of the problem that web authors are currently facing with scrolling content. As always, remember that we’re here to help, either with design or development services. We love making great looking products, no matter if they’re dark or light! No matter what some people think, there are some things that a native app can do better than the web. One of those things is providing a system-wide sharing extension. With the release of Twitterrific 5.3.7 for Mac, we’re happy to announce that we now fully support sharing. After downloading the update, you’ll need to enable it in System Preferences (under Extensions > Share Menu). After that you’ll see Twitterrific show up in when you click on the sharing icon. Another thing we’ve done to embrace System Preferences is add new timeline theme options that follow your current Light and Dark Mode setting. It’s perfect for folks who use utilities to automatically switch based upon location or time of day. For a full rundown on what’s new, including important changes in the About box, check the version history. If you’re not already a customer, check out the features or download the app today! For over 20 years, we’ve been celebrating our favorite holiday on the Iconfactory home page. Yes folks, it’s that time of year again: Halloween! It all started long ago with The Great Pumpkin and we haven’t looked back. If you love this holiday as much we do, there’s a page that will give you an endless source of joy. And terror. And here’s one final treat: after you turn on Dark Mode, set your Accent color to orange in the General panel of System Preferences. Boo yah! On the eve of Apple shipping the most advanced iPhones in the company’s history, we’re pleased to announce a brand new version of our elegant digital sketching app. Designed specifically for iPhone, Linea Go is an amazing companion to the critically acclaimed iPad app and is now available for pre-order on the App Store. When we designed Linea Sketch for iPad, we crafted it to be elegant and powerful enough to record your thoughts and ideas, but without overloading you with a myriad of tools, options, and settings that are common in other drawing apps. Little did we know we were also laying the groundwork for Linea Go and the need to conserve real estate on a phone’s screen. The result is an app that’s always with you, simple, and ready to take notes, sketch concepts, or record ideas with either your finger or a stylus. Linea Go’s concise set of tools puts focus on your work, not the interface. Choose from a small but powerful set of best-in-class drawing tools like the Art Pencil, Technical Pencil, Marker, or Pen. Effortlessly switch between pre-defined brush sizes, blending modes, and even quickly switch to Linea’s eraser with a long press of the selected tool. So easy! Thanks to iCloud, your work is always in your pocket, ready to go. Start sketching an idea on iPhone and continue it later with Linea Sketch for iPad and an Apple Pencil. iCloud keeps your ideas in sync and provides a safe backup of your important projects. Like its iPad big brother, Linea Go offers top-notch color controls that are designed to take up minimal space while giving you the most flexibility for sketching or taking notes. Tints and shades are generated automatically, saving time and effort. Banks of pre-defined color sets let you choose a palette that’s right for the work, or you can create a new set with your own custom colors. Be sure to visit Linea’s Tips & Tricks to learn techniques that will save you time managing colors, tools, and more. Linea Go lets you record every movement while you work. Drawing sessions can be saved directly to your iPhone’s camera roll and make a great way to show your ideas to friends, followers, and colleagues. You can also live stream to services like Mobcrush (or any other that’s compatible with the ReplayKit standard.) You can give play-by-play descriptions as you work, complete with video from the iPhone’s front-facing camera! Be sure to check out our knowledge base on how to set up live streaming in Linea. Landscape support lets you turn your iPhone on its side and get an aspect ratio that’s perfect for storyboarding or sketching the world around you. Elegant layers let you compose drawings just how you want them: a small screen becomes expansive when you can move layered pieces around easily. ZipLine provides an intuitive solution for drawing straight lines on the smaller screen of the iPhone: just hold the drawing tool still at the end and everything straightens out. Do it again and they connect to each other. Quickly import images into a layer for reference or tracing. Marking up screenshots is a breeze! Pre-orders for Linea Go will get an automatic download on your iPhone when the app becomes available on Wednesday, September 26th. If you still haven’t tried Linea Sketch for your iPad it’s currently on sale but will be returning to its regular price with the release of Linea Go. Now is a great time to take advantage of the savings. Have more questions? Be sure to visit the Linea Knowledge Base for answers and then head to the App Store to pre-order Linea Go for your shiny new iPhone today. Starting tomorrow, Twitter will begin to turn off, or deprecate, two important API’s that third party apps use to interact with their service. Twitter will start slowly phasing these features out on Thursday, August 16th, and completely shut them off by August 23rd. We’ve spoken about these changes at great length in the past but wanted to remind Twitterrific users about what is happening. Although Twitterrific will no longer stream tweets in real time, we’ve implemented automatic refresh for both the iOS and macOS apps. This means that if you had previously enabled live streaming in Twitterrific, the app will now instead check for new tweets every two minutes. Unfortunately, this means that tweets and DM’s will be slightly delayed, but hopefully you won’t notice too much of a difference. Since Twitterrific will no longer connect to Twitter’s push notification stream, we can no longer inform you immediately when someone likes, RT’s, mentions, or sends you a direct message. The app still badges the appropriate icon at the top of the timeline with an unread dot after loading the latest tweets, but if your iOS device is asleep, you won’t get a notification on the home screen. To work around this problem we suggest you download the official Twitter client for iOS, add any and all Twitter accounts you want to receive push notifications for and enable them. Once you turn them on, be sure to head back to Twitter’s in-app preferences and then customize the types of notifications you want to receive. NOTE: By default, Twitter enables their “Quality Filter” so you’ll need to turn this off if you want to receive notifications for ALL tweets, not just those Twitter deems important. Once this is done, you’ll be notified of events like you’re used to with Twitterrific (except for Quoted tweets). You can then launch Twitterrific to respond to these notifications as needed. Since the information displayed by Twitterrific’s Today view was collected using Twitter’s push notification stream, this feature will no longer function. We’d like to work around this limitation and once again provide a view where you can view your most recent activity, but additional future API restrictions may make this impossible. We’ll all have to wait and see. If you have additional questions about how Twitter’s API changes affect you as a Twitterrific user, be sure to visit our Knowledge Base to learn more. We’ll be responding to problems and questions on Twitter all week so be sure to follow @Twitterrific for the latest news and information. You can also follow #BreakingMyTwitter on Twitter to see what others are saying. Finally, we’re committed to continued development of Twitterrific as long as it makes financial sense and is allowed by Twitter. Despite these changes, we hope you’ll continue to use and support us into the future. We’re not going anywhere.